Is there a more iconic symbol of the wonderful world of science than a white coat? I can’t think of one, not one that spans the vast realms of medicine, research, and wide range of applied sciences. "See how I hold the stethescope? Lexie's heart sounds healthy!" here. This adorable beagle is eleven years old and has patience to spare. Lexie’s “on duty” as a patient of Kathleen Bedard. She’s demonstrating the proper way to listen to a dog’s heart. A native of Michigan, Kathleen is a second-year student at the world-renowned College of Veterinary Medicine at North Carolina State University. Kathleen, white coat and all, would make a perfect guest in any elementary school classroom! 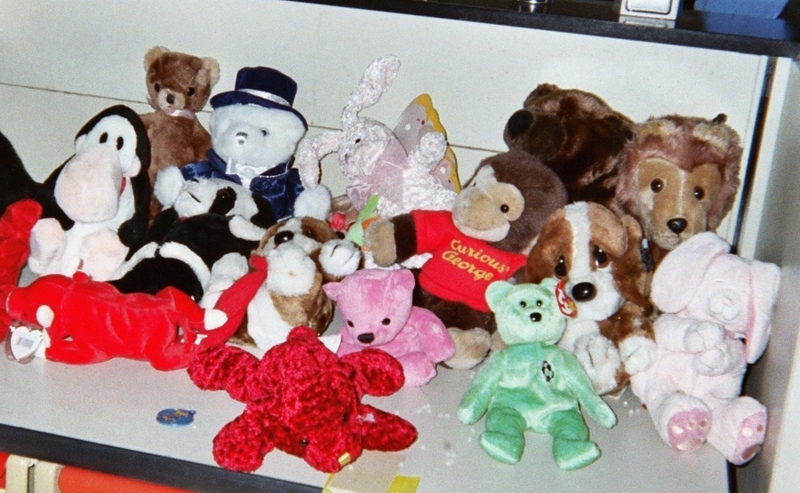 SET UP A STUFFED ANIMAL CLINIC – If you’re able to schedule a classroom visit with an animal care-giver, you’ll delight your students when you set aside time for your guest to conduct a Stuffed Animal Clinic (recommended for grades Pre K – 2) like you see in my blog pic below. 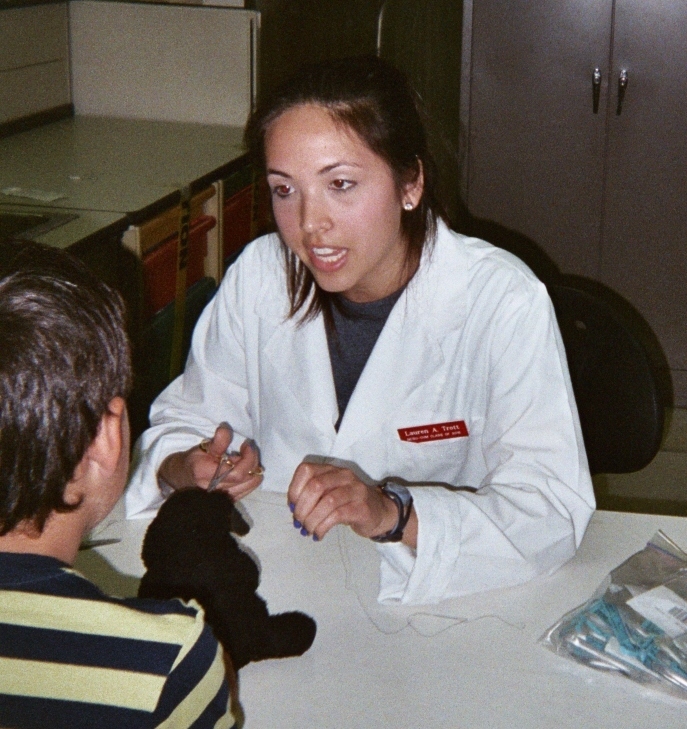 Lauren Trott, a first-year veterinary student from North Carolina, is finishing “surgery” on a small black (stuffed) dog. "I just have to snip the suture and your dog will be fine!" The dog’s owner is happy and a bit more familiar with the science of veterinary medicine, having spent some quality time with Lauren. The Stuffed Animal Clinic is crowded with patients! here has a waiting list! 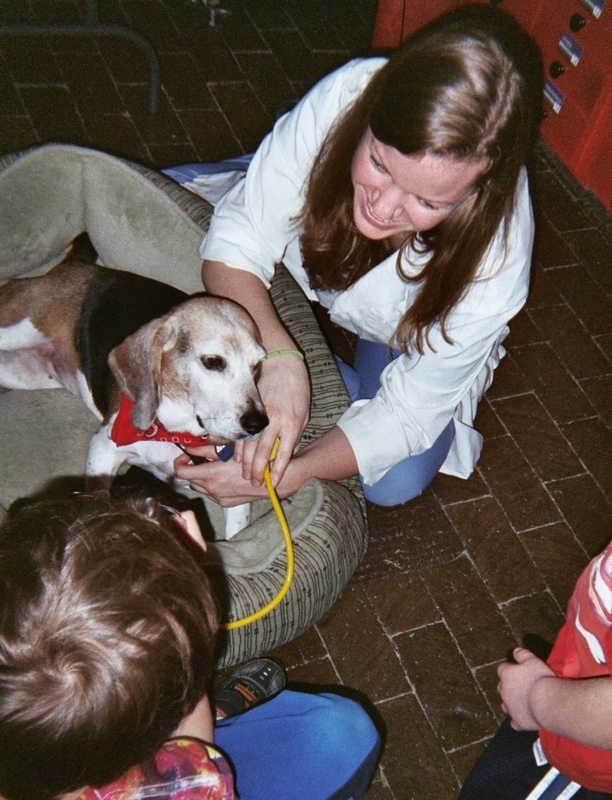 Thank goodness the NC State Vet School, where this pic was taken, is full of capable students eager to help children learn about animal medicine. CREATE SCIENCE CAREER TIME IN YOUR CLASSROOM – You may opt to invite a white-coated professional in a field other than veterinary medicine. No problem. The key is to catch and keep elementary school student interest in S.T.E.M. – Science, Technology, Engineering and Math. If you’re working with students in grades 3 – 5 you may want to schedule a series of classroom guests over a period of weeks, or even months – one guest who works in each of the four S.T.E.M. fields. Wouldn’t that be cool! Access to science and medical professionals will depend, of course, on where you live, but I’ve noticed in my community that people in businesses and industries related to science and medicine are eager to help teachers involve students in science education. ASK STUDENTS TO SLIP INTO A WHITE LAB COAT – Remembering actress, Kathryn Hepburn’s expression, “Theater is practice for living,” you may want to borrow or buy a white lab coat for your classroom. Let students take turns role-playing a scientist. This attention-ology trick offers all kinds of possibilities, especially for grades 2 – 5. For example, students can select a grade-level curriculum-based focus for a science research project to do. When they’ve completed the work, (may include a written paper with supporting graphics or illustrations) you can schedule science “presentations.” Set up a “scientist table” at the front of the class or provide “scientist’s access to a smartboard,” along with – you guessed it – the white lab coat for each presenting “scientist” to wear. You know that kids love costumes; allowing your students to look like and feel like a scientist during this school year may be a step to them becoming one for real, years from now. 5 Pings/Trackbacks for "White Coats Create Focus on Science"